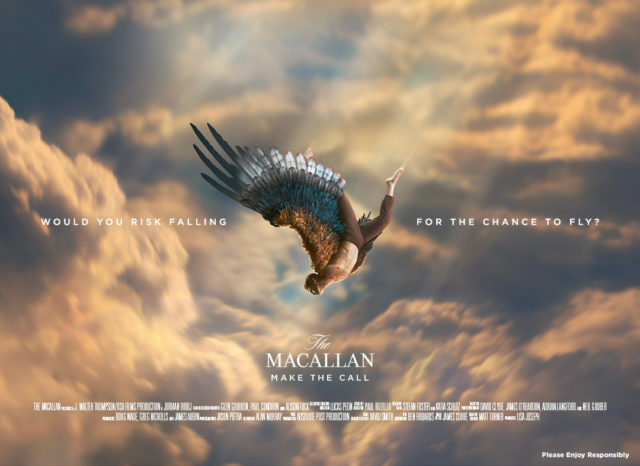 An advert that appeared on television and social media promoting Edrington-owned whisky brand The Macallan has been banned by the UK Advertising Standards Authority (ASA) for linking alcohol with risky and irresponsible behaviour. The advert, which appeared on television, on video on demand (VOD) service ITV Hub and as a paid-for ad on Instagram, has now been banned from appearing in its current form in the UK. The ASA said it had received six complaints against the campaign which stated that the adverts were “irresponsible and linked alcohol with daring, toughness or irresponsible behaviour”. Edrington argued that the line ‘make the call’ was used around the world as part of the whisky’s branding and was based on the decisions made in the history of The Macallan. The distiller also said that the ad featured a “fantastical story” which was mystical and “clearly removed from the real world”. Furthermore, it asserted that the advert did not show anything that could happen in real life, and did not depict anyone consuming alcohol. Clearcast, a non-governmental organisation which pre-approves most British television advertising, said that the ‘daring and toughness code rule’ had been considered as part of the approval process. It had ruled that the ad was “fantastical enough to be acceptable”. ITV which had shown the ad on its channels and VOD service said “the ad was imaginary, fanciful and dreamlike” and was “detached from reality”. Instagram added that the advert had not violated any of its policies and had not received any complaints about it. The ASA, however, said the opening scene of the man running and jumping off a cliff was reminiscent of the extreme sport of base-jumping. It found that in places, the advert was not fantastical enough with there being “no suggestion that the male character had any super-human attributes or powers” and that the scenery depicted “was a typical mountainous landscape”. It added that the close-up of the man clenching his fists “gave the impression that he was nervous about jumping” and was mustering the courage to launch himself over the edge. “Whilst we acknowledged that some elements of the ad were fantastical, such as the distance the man fell through the clouds, and the sprouting of wings which enabled him to fly away instead of hitting the ground, we considered, nevertheless, that the central message of the ad, which was explicitly highlighted through the tagline “Would you risk falling … for the chance to fly?”, was one of promoting risky or daring behaviour to reap possible rewards. “Although the character was not seen consuming alcohol at any point, we considered the ads made a clear association between an alcoholic product and potentially very dangerous, daring behaviour and concluded that they were irresponsible. The advert, which was unveiled in December 2018, was ruled to have breached BCAP code roles for social responsibly and alcohol. Edrington is now banned from running the advert again in the UK in its current form. A spokesperson for The Macallan brand said that the company had co-operated fully with the ASA investigation following “a small number of complaints about our brand’s global awareness campaign”. “In light of the ASA ruling, we have acted to address their concerns and removed the campaign film from relevant channels accessible by the UK audience. The advert was part of the brand’s first global campaign which set out to “avoid category clichés”. Developed by creative agency J Walter Thompson London, it aimed to showcase “bold decision making” focusing on the Scotch’s top markets which include the US, Mexico, Taiwan, China and the UK. The release of the campaign in 2018 topped off a major year for the brand which saw it open its new £140 million distillery in June.